Americans with Disability Awareness: October is National Disability Employment Awareness Month! October is National Disability Employment Awareness Month! The purpose of National Disability Employment Awareness Month is to educate about disability employment issues and celebrate the many and varied contributions of America's workers with disabilities. Held annually, National Disability Employment Awareness Month is led by the U.S. Department of Labor's Office of Disability Employment Policy, but its true spirit lies in the many observances held at the grassroots level across the nation every year. 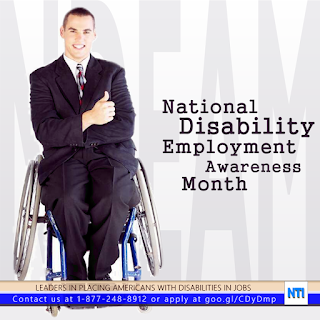 Employers of all sizes and in all industries are encouraged to participate in NDEAM. NTI will be specifically participating in a variety of different ways including press releases, staff education, Tweetchats, videos, webcasts, unique social media postings, employee spotlights, proclamations and interviews with Paralympian’s. It should be a good month! For the staff in Boston, today, we are handing out posters for NDEAM that they can either hang inside or outside of their cube! Creativity counts! If you have more ideas that you would like to bring to the table, please feel free to do so. In addition, here are some of the resources for our social media links! Feel free to follow along, favorite, Tweet, or of you would like to be a ghost presenter, let me know. Both employers and job seekers can support National Disability Employment Awareness Month! Find out how through the posts NTI will place over the course of October. Also, if you would like to be considered for one of the positions in our exclusive Fortune 500 positions, feel free to visit our website at nticentral.org to apply!